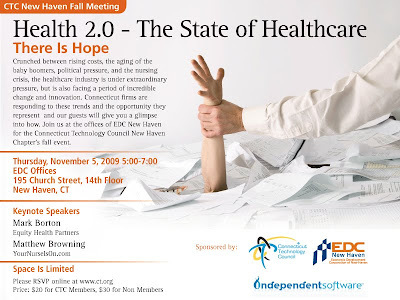 YourNurseIsOn.com CEO Matthew Browning will be speaking on trends in Health 2.0 at the New Haven chapter of the Connecticut Technology Council on November 5, 2009. YourNurseIsOn.com is helping hospitals, nursing facilities and agencies realize increased efficiencies and cost savings when contacting and confirming their health care staff. YourNurseIsOn.com is excited to work with the Connecticut Technology Council to share innovative healthcare technologies with its members and thankful to Independent Software and the EDC of New Haven for hosting this event. Come on down and see us! !